The growth of the global market for anti-infective drugs hinges onto the development of the research domain within the medical industry. Transparency Market Research (TMR) elucidates the competitive dynamics of the global market for anti-infective drugs and presents an analysis of the trends exhibited by the market vendors. It is anticipated that the leading market players in the global anti-infective drugs market would reap in commendable benefits from the growing need for anti-infection treatments. The market is expected to witness a series of mergers and acquisitions involving small, medium, and large-sized market players. This trend is projected to come about as a result of the instable dynamics of the global market for anti-infective drugs. The leading market players in the global anti-infective drugs market are expected to counter the entry of new vendors by rolling out key plans for better research and development. Furthermore, these market players are also projected to make an archetype of development based on their past experiences. Some of these key players in the global anti-infective drugs market are Merck & Co., Inc., Pfizer, Inc., Bayer AG, GlaxoSmithKline plc, Gilead Sciences, Novartis AG, and Bristol-Myers Squibb. Transparency Market Research (TMR) estimates that the global market for anti-infective drugs would accumulate revenues worth US$ 153.3 Bn by 2025, rising up from a value of US$ 106.5 Bn in 2016. Furthermore, the CAGR of the global anti-infective drugs market is projected to be 4.20% for the period between 2017 and 2025. Based on the type of drugs, anti-viral drugs have attracted the highest demand over the past decade. On the basis of geography, the market for anti-infective drugs in North America is expected to outdo other regional segments. Anti-infective drugs can be used for a variety of purposes including killing infectious microorganisms or suppressing their effect. Hence, the rising incidence of diseases caused by bacteria, viroids, viruses, macro parasites, and fungi is expected to bring in commendable revenues within the global market for anti-infective drugs. Furthermore, the introduction of several new drugs in the market has also expanded the scope of growth for the market players. Despite the affluent growth of the medical sector, the gap of unmet needs is expansive, and this leads to the increased usage of anti-infective drugs in the medical industry. Moreover, antibacterial resistance is necessary to ensure that surgeries and other invasive treatments have a higher success rate. This also leads to the growth of the global market for anti-infective drugs market and creates lucrative opportunities for market players. Several new opportunities have opened up for the market players in the global market for anti-infective drugs. However, the strict regulations with regards to the usage of drugs could act as a hindrance to the growth of the global market for anti-infective drugs. Furthermore, the side-effects of consuming these drugs for prolonged durations have also raised apprehensions in the minds of the consumers. Nevertheless, the extensive prescription of anti-infective drugs by the medical practitioners shall prove to be beneficial for the global market. 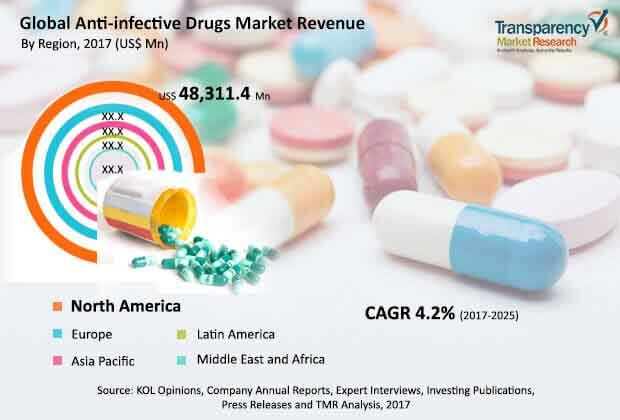 The review is based on TMR’s report titled “Anti-infective Drugs Market (Type - Anti-bacterial Drugs (B-lactams, Quinolones, Macrolides, Tetracycline, Aminoglycoside, Others (Sulfonamide, Phenicols)), Anti-fungal Drugs (Azoles, Echinocandins, Polyenes), Anti-viral Drugs; Indication - Pneumonia, Methicillin-resistant Staphylococcus Aureus (MRSA), Sepsis, Tuberculosis, Dermatophytosis, Aspergillosis, Candidiasis, Hepatitis Virus Infection, HIV Infection, Respiratory Virus Infection; Distribution Channel - Hospital Pharmacy, Retail Pharmacy, Online Sales) - Global Industry Analysis, Size, Share, Growth, Trends, and Forecast 2017-2025”.